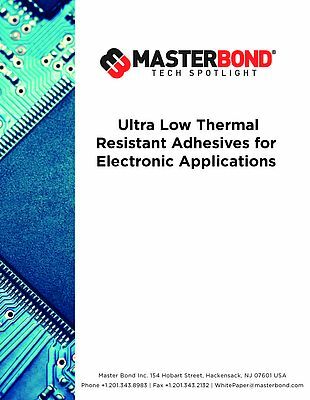 Master Bond thermally conductive adhesives are uniquely qualified to meet the increasingly diverse requirements of advanced electronics systems. From their traditional use as fastening materials, adhesives find wide application in bonding and encapsulation in nearly every application segment, including military/aerospace, medical, automotive, and industrial, among others. In their traditional application in computer and communications systems, thermally conductive adhesives have long played a vital role at the chip level for die attach, at the PCB level for heat sink bonding, and at both the chip- and board-levels for all types of thermal management methods. As the semiconductor industry pushes toward smaller, higher density devices, product manufacturers face greater challenges in assembling die, package, and other components into products able to cope with increasing heat loads.